(Nanowerk Spotlight) Nanowires are considered a major building block for future nanotechnology devices, with great potential for applications in transistors, solar cells, lasers, sensors, etc. (see for instance: "Nanowires for the electronics and optoelectronics of the future" and "Nanotechnology explained: Nanowires and nanotubes"). Now, for the first time, nanotechnology researchers have utilized nanowires as a 'storage' device for biochemical species such as ATP. Led by Seunghun Hong, a professor of physics, biophysics and chemical biology at Seoul National University, the team developed a new nanowire structure – which they named 'nano-storage wire' – which can store and release biomolecules. Reporting their findings in the July 16, 2013 online edition of ACS Nano ("Nano-Storage Wires"), Hong's group demonstrated that their nano-storage wire structure can be deposited onto virtually any substrate to build nanostorage devices for the real-time controlled release of biochemical molecules upon the application of electrical stimuli. "Our nano-storage wires are multisegmented nanowires comprised of three segments and each segment plays a role in extending the applications of the nanowire," Hong explains to Nanowerk: "1) the conducting polymer segment stores biomolecules; 2) the nickel segment allows the utilization of magnetic fields to drive the nanowires and place them onto a specific location for device applications; and 3) the gold segment enables a good electrical contact between the deposited nano-storage wires and the electrodes. The polymer segment is utilized for the controlled release of ATP molecules. The nickel segment enables the magnetic localization of nano-storage wires, while the gold segment provides a good electrical contact with electrodes." The released biomolecules from such a nanowire-storage system can be used for instance to control the activity of biosystems. As a proof of concept, the researchers stored ATP in their nano-storage wires and released it by electrical stimuli, which activated the motion of motor protein systems. The team also demonstrated flexible nanostorage devices. Here, nano-storage wires were driven by magnetic fields and deposited onto nickel/gold films on a transparent and flexible polyimide film. The device transmitted some light, and it can be easily bent. 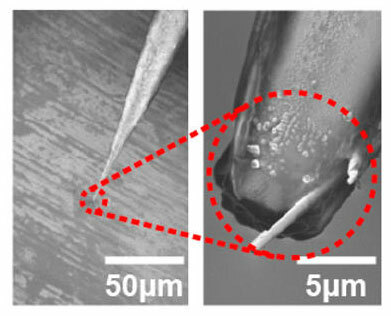 They also showed that the nanowires could be deposited onto curved surfaces such as the sharp end of a micropipet. "Such probe-shaped storage devices can be used for the delivery of chemicals to individual cells through a direct injection," says Hong. "Basically, our results show that nano-storage wires are quite versatile structures and we can deposit them onto virtually any structure to create nanoscale devices for the controlled release of biochemical materials." "Nano-storage wires will allow the fabrication of advanced biochips which can activate or deactivate the activities of biosystems in real time," Hong points out. "The activation and deactivation of biosystems such as biomotors, are controlled by specific biomolecules. In our method, we can selectively control the biomolecular activities related with ATP or any released chemical species while leaving other biomolecular activities unaltered." Having demonstrated the storage of ATP, the team is now planning to store other biomolecules in our nano-storage wires. Examples are drugs to control the activity of cells and tissues, enzymes to activate specific signal pathways in biosystems etc. "Eventually, we would like to build an advanced biochip which can be utilized to control the activities of desired biosystems in real-time," says Hong.